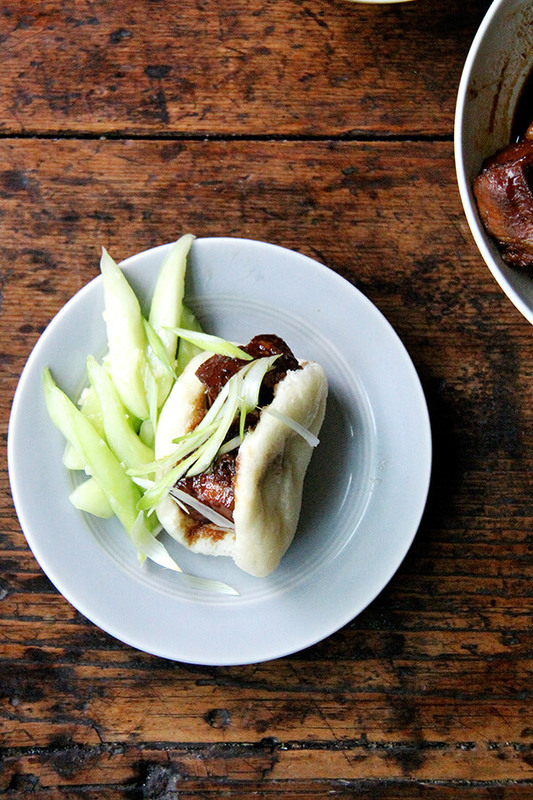 About five years ago, I met my sister in NYC to see Wicked and, more importantly, to eat pork buns at Momofuku, which, to no surprise, I spent most of the show dreaming about—the steamed buns, the glazed pork belly, the pickled cucumber, all of which I had heard so much about. But when we found ourselves at SSam Bar and ready to order, our waiter delivered the news: No pork buns tonight. Blast! Five years later, I have yet to experience the legendary bun, but last week I think I came close when I made the red-cooked pork from Phoenix Claws and Jade Trees. Red cooking is something I’ve heard about over the years, a style of cooking that for whatever reason has felt out of reach. But when I read about the various types of Chinese slow cooking in PC&JT and in particular about red cooking — the most common braising technique — it suddenly felt doable. I’ve since discovered it’s actually a very simple process, amounting to four steps: 1. Parboil the meat (a common practice in Chinese slow-cooking). 2. Melt sugar in a little bit of water until it begins to caramelize. 3. 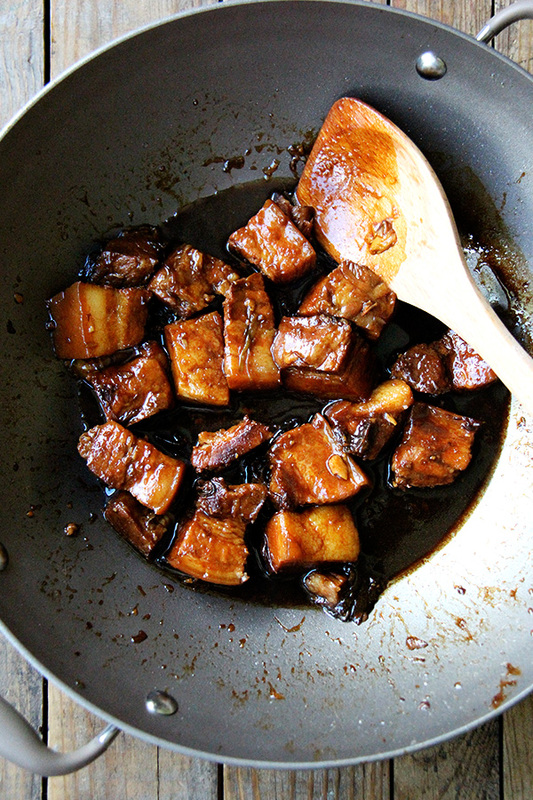 Glaze the meat in this caramelizing sugar. 4. Add aromatics (like garlic, scallions, star anise) and some liquids (typically rice wine, soy sauce and stock) and cook until done. Incredibly, I was able to find local pork belly, the cut of choice for red-cooked pork, as well as local pork shoulder, and I made the red-cooked pork two ways, the belly stovetop as directed in the recipe, the pork shoulder in the slow-cooker (see notes in the recipe). To get closer to that Momofuku experience, I took a stab at making steamed buns, and while I forgot a few ingredients — oops! — they materialized and served their purpose, acting as a soft cradle for the tender cubes of pork, a sponge for the rich, sweet sauce. 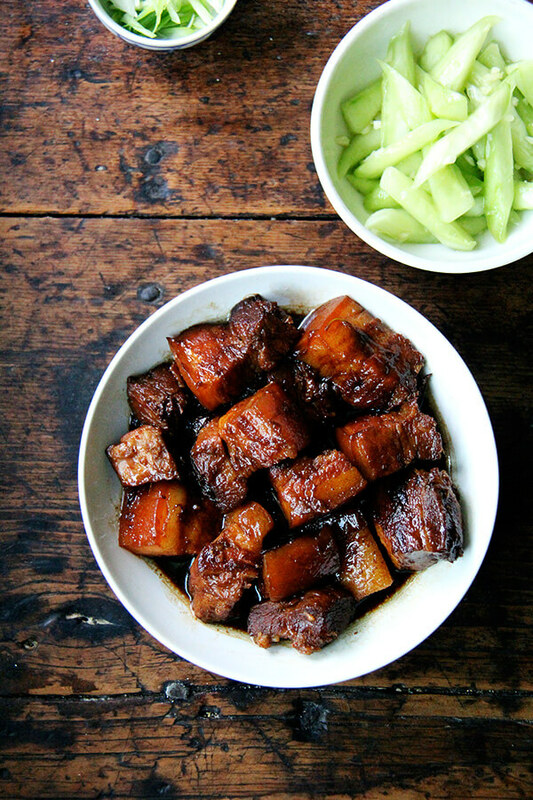 In PC&JT, Kian notes that red-cooked pork is considered Chinese comfort food, something he ate once a week when he was growing up in Singapore, but for special occasions, the pork was served sandwich-style in steamed buns. I served the pork with PC&JT’s cucumber and garlic salad, which has become an every-other-day staple this past month. 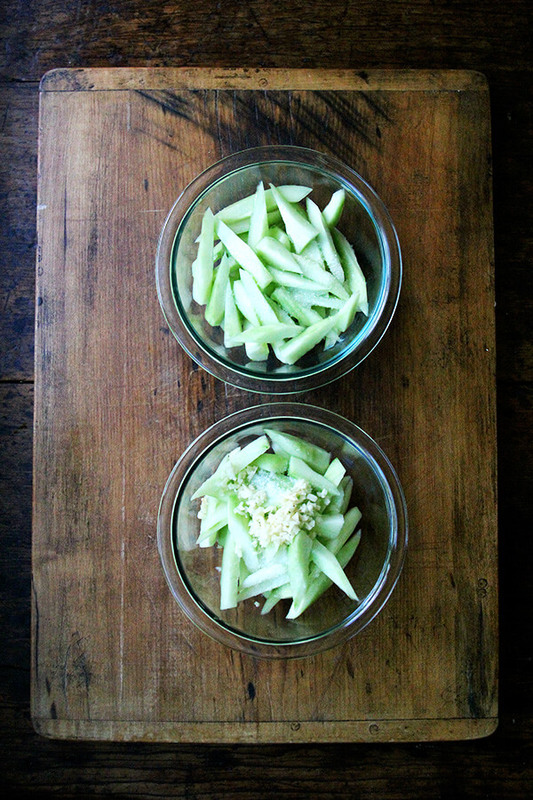 It’s the simplest cucumber salad I’ve ever made, and it might be my favorite — slice cucumbers and toss with salt and garlic, stick them in the fridge for 20 minutes, drain off the liquid, toss with sesame oil. 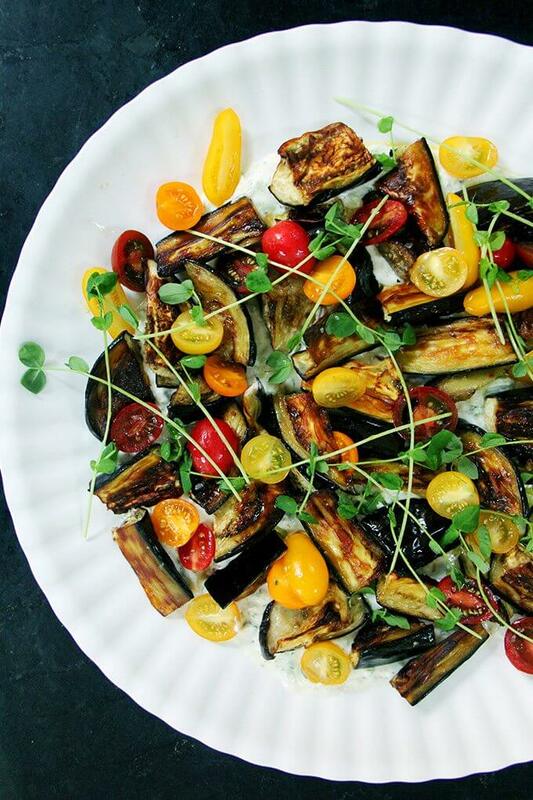 Cold, straight from the fridge, this salad is irresistible. I make an even simpler version for my children, who also love it. Friends, exciting news! Clarkson Potter is giving away one copy of Phoenix Claws and Jade Trees, a book I love for many reasons but most especially for how it’s organized — by technique — which means that once you learn to make red-cooked pork, you can make red-cooked chicken, red-cooked fish, red-cooked tofu, etc. 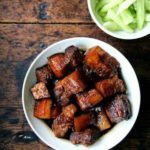 The author, Kian Lam Kho, is a chef and teacher, and just as he does on his blog, Red Cook, he explains so well the fundamental concepts of Chinese cooking while also giving historical context. There isn’t an easy-Asian-every-day vibe in this book, but this isn’t to say there aren’t many simple recipes — the cucumber salad takes 5 minutes to assemble, the three cup chicken (more on this soon) could be made any night of the week. Friends, more exciting news! 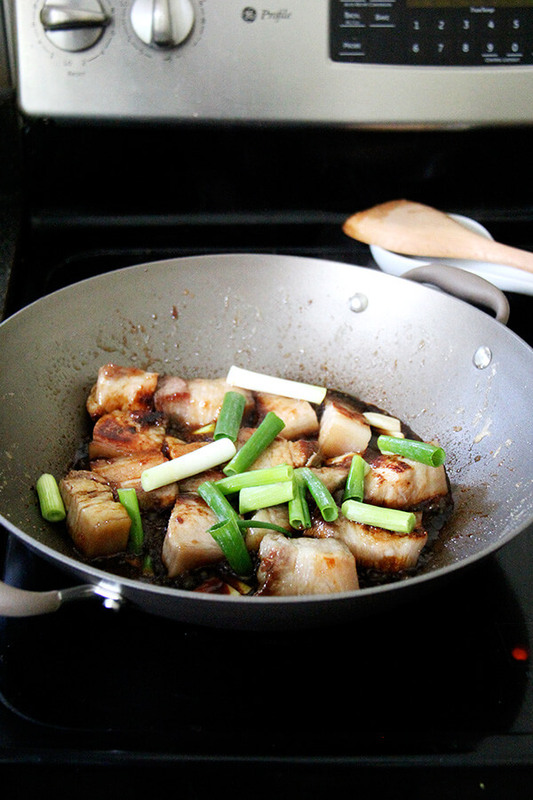 Anolon is giving away this wok: Anolon Advanced Umber 14-Inch Covered Wok with 13-Inch Pointy Spoon, which is pictured in the photos below, and which I found so handy for the pork belly, because the wok has a lid (! ), allowing for stovetop braising. UPDATE: GIVEAWAY IS CLOSED. Winner is Heather. Thanks for so many great comments. Top bowl for the kids: just salt + cucumbers + 20 minutes in the fridge; bottom bowl for Ben and me: salt + garlic + cucumbers + 20 minutes in the fridge + sesame oil. I’ve been making this every other day—so simple, so good. I was able to find local, humanely raised pork from the Albany Whole Foods. Apparently the pork belly comes in on Friday mornings, but they also carry pork shoulder from the same farm, Briarwood in Western New York. Ingredient Notes: Dark soy sauce is aged in clay jars for 6 to 9 months after the initial fermentation. It can be found in Asian markets. I made the trip to pick some up, because I also wanted to find Shoaxing cooking wine, which I actually did not ultimately find. Dry sherry is a fine substitute for the Shoaxing wine, and while I had no trouble finding the dark soy sauce, I imagine regular soy sauce will give similar results. I omitted the star anise — Kian gives permission to! — because it’s not my favorite flavor, but I know I am in the minority with this one, so add it if you wish. To make a pork shoulder and then use the slow-cooker, you follow nearly the same procedure: parboil the shoulder but for longer, probably about 40 minutes. Remove it from the liquid, let cool, then cut into large pieces. Because the shoulder was so much larger than the belly, I placed the pieces directly into the slow cooker, then made the sauce stovetop, and poured it into the slow cooker. I cooked the meat for 6 hours in the slow cooker, refrigerated the whole ceramic insert, scraped off the fat the next day, then reheated the whole ceramic insert for a few more hours. It was delicious over polenta—this would be great for a fall gathering. 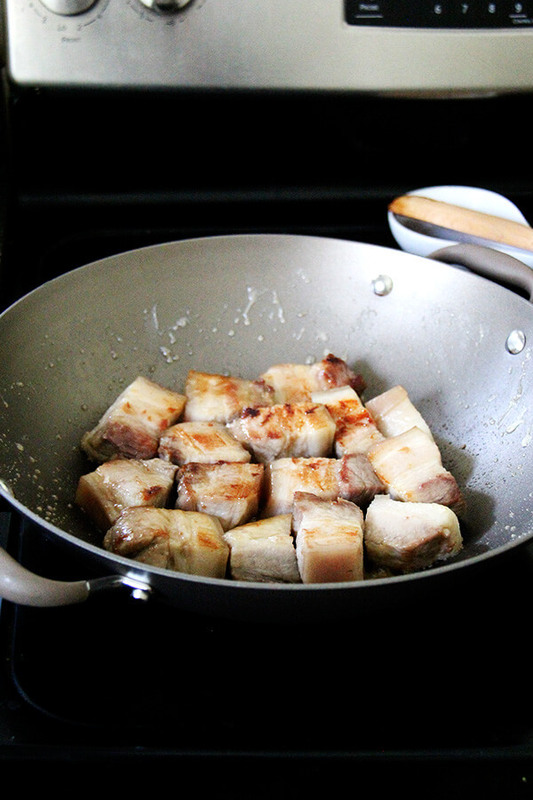 Put the entire pork belly in a stockpot and add enough water to cover the meat completely. 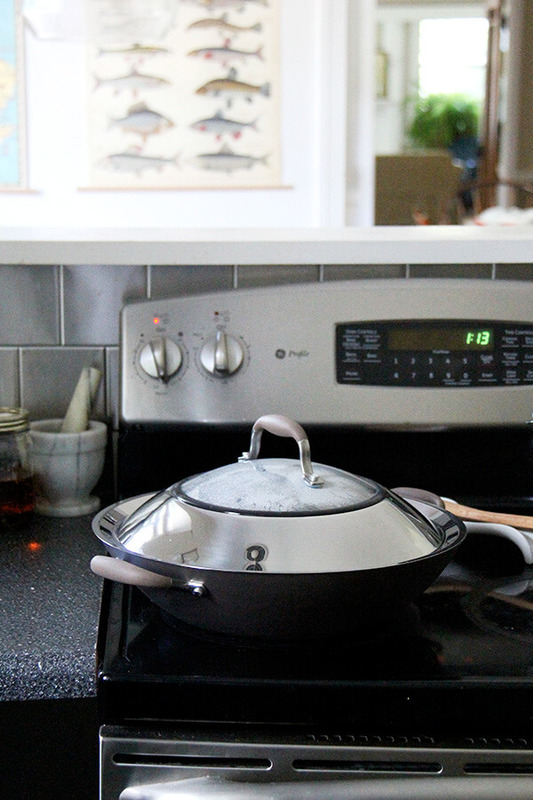 Bring the water to a boil, then turn down the heat to medium. 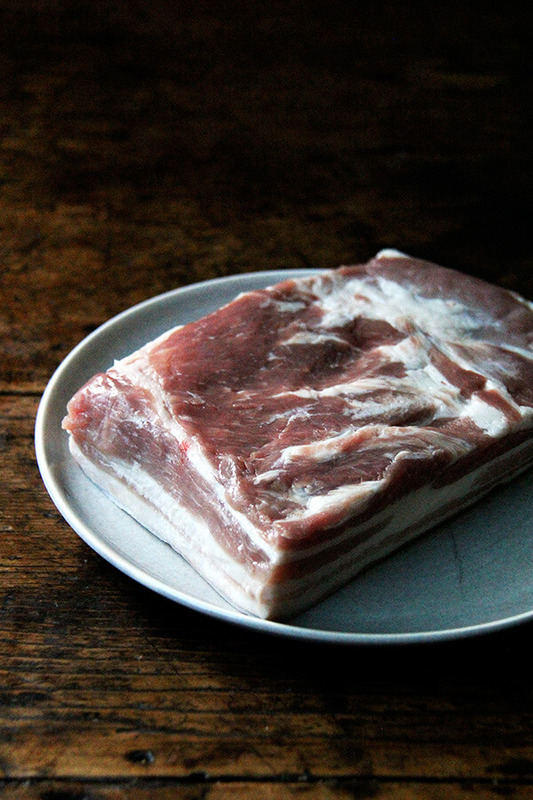 Parboil the pork belly, uncovered, for 20 minutes, continuously skimming off the scum that forms on the surface. Drain, and let the pork belly cool. Then cut it into pieces about 1 1/2 inches square. Combine the sugar with 3 tablespoons water in a wok over medium heat. Continue heating until the sugar syrup just begins to turn yellow. 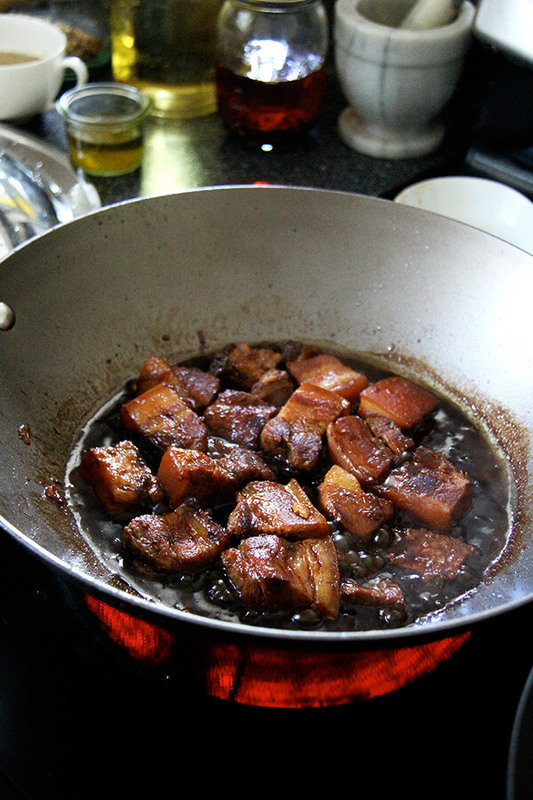 Add the cubed pork belly to the wok and brown it with the caramelized sugar, stirring the meat regularly to prevent burning. 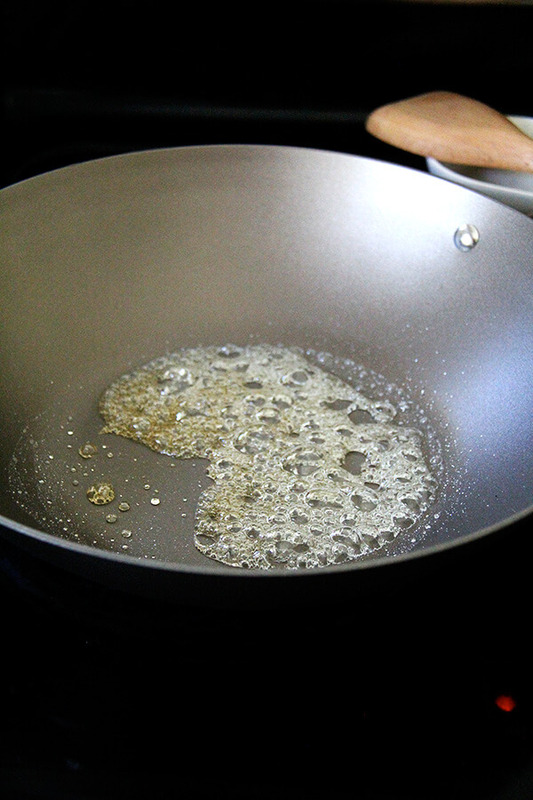 If you like, cover the wok with a splatter guard to prevent the fat from splattering. Add the garlic, scallions, star anise (if using), both soy sauces, wine or Sherry, and stock (or water) to the wok. Bring the liquid to a boil, then transfer the contents to a clay pot or Dutch oven (or, if your wok has a lid, use it to cover the pan. Or, transfer the contents to a slow cooker.) Simmer, covered, over low heat, stirring the meat every 15 minutes to prevent scorching the pork on the bottom, for 1 hour or until the meat is tender when pierced with a knife—I cooked mine for about 1hr 45 minutes. Remove the meat and put it in a bowl. Reduce the sauce over medium-high heat until it reaches the desired consistency. Return the meat to the pot and reheat before serving. Note: When I removed the meat from the pan, I also transferred the braising liquid to a liquid measuring cup, let the fat settle, and scooped most of it off, before returning it to the pan to reduce further. my favorite Chinese dish: ma po tofu! do you have a good recipe? Every one I see looks complicated, which I am up for if need be, but I would love a simple maps tofu recipe … does it exist? I love fried and sauteed eggplants with soy sauce. I love a bit of crunchy and pillowy texture of eggplants. Also I love knight Chahng’s beef which is spicy beef stew. I do stir-frys with any sort of vegetables I have around. Thanks!! OMG that pork belly looks good. I love wonton soup! I love to cook Asian food at home, most often stirfries or dishes like cashew chicken! But I also love to also make dumplings: a favorite is pork and summer squash! As a grad student, my weeknight dinners have to be fast, delicious, and make good leftovers. I know its boring, but at least once a week, I find myself stir-frying odds and ends from my weekend market haul. It is one of my dreams to eat at Momofuku! Hopefully one of these days I’ll get the chance. 🙂 As for Chinese food, I’m huge fan of soup dumplings and any pretty much any kind of bao. So delicious! Beef Bulgogi is my favorite. I love any kind of fried rice and dumplings! My fil was a cia engineer building bridges in the Viet nam war..he befriended many locals and learned to cook authentic cuisine..and, got the recipes. Not exactly Chinese but close..and all so delicious. My fave are his beef and vegetables or chicken and peanut sauce..most have some heat. I know have all the recipes . Such a healthy way to cook! Love it. It may be overly simple, but I love fried rice. I’ve only recently begun making it at home, and I don’t know what took me so long. So good! This looks beautiful, tasty and completely doable-thank you…I’ve been to intimidated to try and reproduce any Chinese food at home, but have wanted to for some time. I think when I do, it will be beef with Chinese broccoli(or any number of green veggies). There’s just something that rich oyster sauce!! *although I believe I will be making this quite soon! Wonton soup is great when the air starts to get chilly. Singapore ‘s Hainan Chicken Rice…rice cooked in the chicken drippings and garlic from the roast chicken, with a special chili sauce…have yet to find anything similar here! Oh wow, that sound amazing! Good old bountiful stir fry, either vegetarian, with chicken or pork. We make steamed brown rice and the leftovers are possibly better! 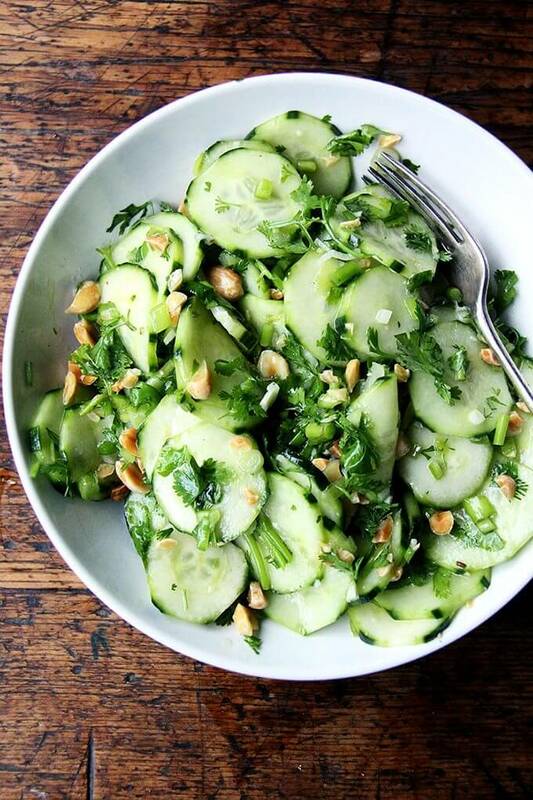 Chinese cucumber salad is one of my go-to dishes of Asian food. I make a similar if slightly more complicated version of that salad which involves smashing the cucumber a bit with the flat of a large knife before the seasoning with salt. 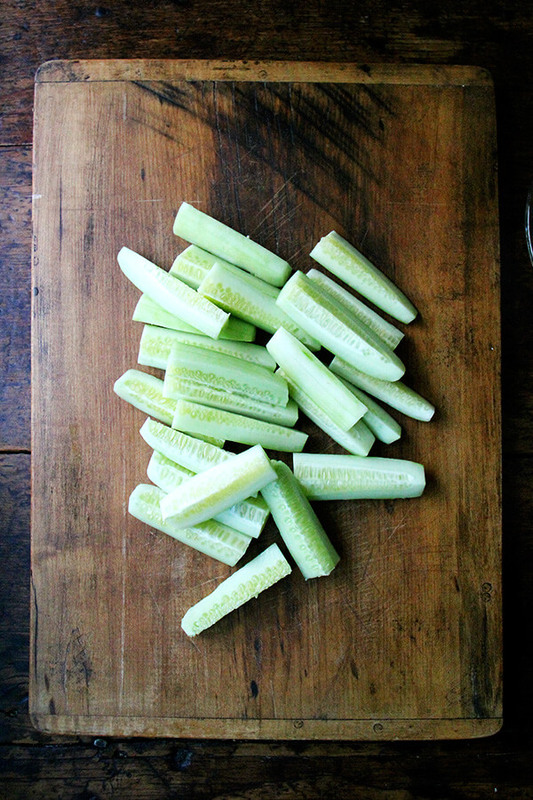 When sliced, the cucumber slices then have a rougher surface area that aids absorption of the salt. It’s also fun to bruise a vegetable. I usually add rice vinegar, sometimes oil, or chili flakes. I make this every year alongside my New Years feast because it is a crowd pleaser, especially with those not into spicier flavors. Also, as a side when I make Korean food. It’s refreshing coolness pairs with anything. I’ve been reading Kho’s blog for about six years I think, and it is him that I thank for specifying the importance of searing/caramelizing the meat before cooking. I had a good recipe before, but that made it great. Thanks for all of this, Heather. Love the sound of this method. Will try soon! 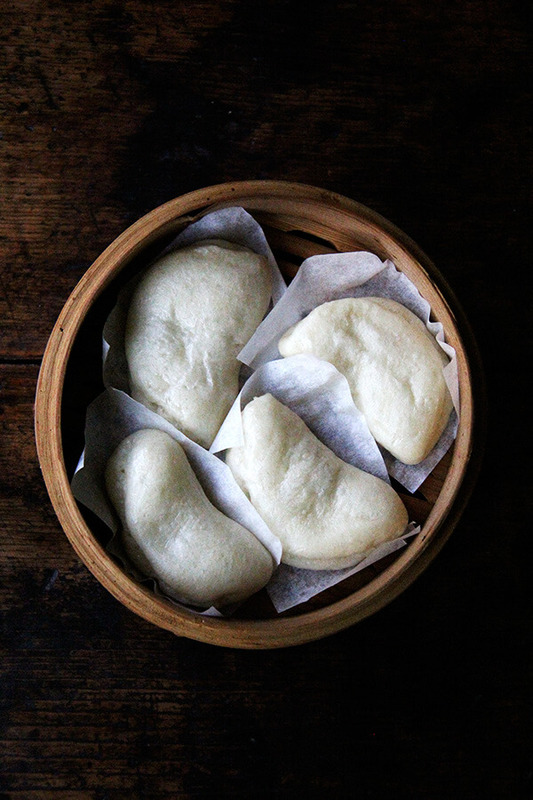 Ohhh…steamed pork buns. Love them. So far the best I’ve had were in San Francisco’s Chinatown. I’ve never had the courage to try making them. Well, that and the person I was married to for 30 years got the well-seasoned wok. So would love a chance at the drawing! Crossing my fingers! Oh man! You’re in the running! I love Sweet and Sour Pork. Thanks so much for the idea of a cucumber salad. I wouldn’t have thought of pairing it with red cooked pork. I love a good dumpling soup. I lived in China for a few months and could eat that every day. 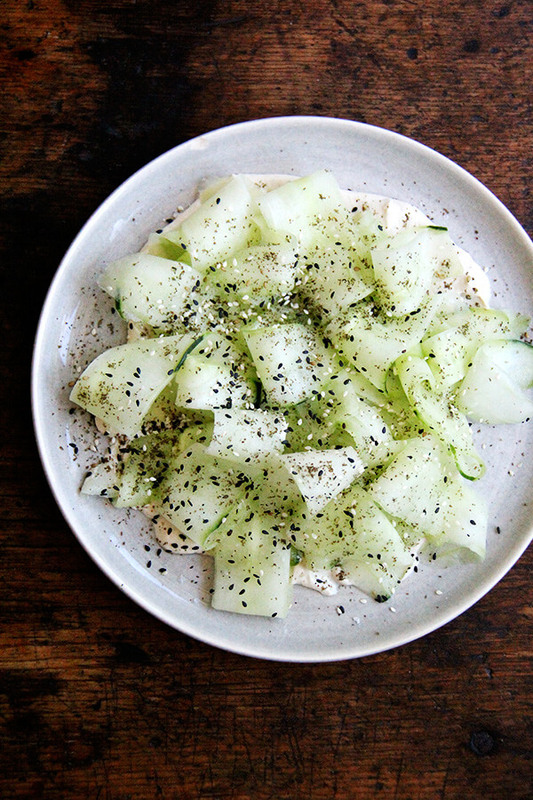 Similar to what you have above, I love a smashed cucumber salad. So refreshing! Made the cucumber salad – so simple and delicious. One question I was keen to ask is whether you know of a way to tone down the harshness of raw garlic? It tastes good, sure, but I find it a little strong and will omit or significantly dial it down whenever a recipe requires it (I used a small amount here). I can see that the raw garlic is key to the authentic flavour of this recipe so I’m reluctant to go down the complete omission route. When I’m putting raw red onion in salads I tend to lightly pickle them, or soak in lemon juice and water to take the edge off– I wonder if there’s similar trick for garlic? Perhaps this is something you’ve never needed to think of… I have plenty of friends who can’t get enough of dips etc. with raw garlic! Alex, it’s always so wonderful to hear from you! Hi. So, I don’t think you are alone here. My mother, for one, does not love raw garlic. And the recipe tester for my cookbook gave me a tip: boil the raw clove of garlic for a minute before mincing it. You could try that, or omitting altogether. This is what I do for my children, and I find it so refreshing, too. Hope you are well!